A Yorkshire brewer has set its sights on breaking into the Chinese beer market after securing orders in Hong Kong and Shanghai for 12,000 bottles of its spirit infused beer. Baijiu Beer Company, which produces craft beer that’s combined with China’s national spirit, Baijiu, will ship its first international order in January after only three months of development in the Chinese market. The export order was secured with support from advisers dedicated to Yorkshire and the Humber businesses at the Department for International Trade (DIT) and the Department for Environment, Food & Rural Affairs (Defra). The Craft Beer Alliance, which helps UK brewers break into the Chinese market, also helped the business to find buyers. It came shortly after the firm’s produce turned heads at Food & Hotel China (FHC) last month, a major tradeshow for the country’s food and drink industry, where UK beer took centre stage with its own pavilion. The brewer exhibited at FHC alongside other Yorkshire food and drink firms as part of the Food is GREAT campaign, the UK Government’s cross department initiative to showcase UK food and drink overseas and to support firms to export. Last year food and drink exports to China from Yorkshire and the Humber increased by 152 per cent. The country has specifically acquired a taste for UK beer, with beer firms seeing a 500 per cent rise in the value of exports last year. Craig Butler, director at Baijiu Beer Company, said: “Baijiu is hugely popular in China, drunk at celebrations and all other kinds of occasions. Infused with our craft beer, it has a floral, fruity fragrance with notes of vanilla and pear. 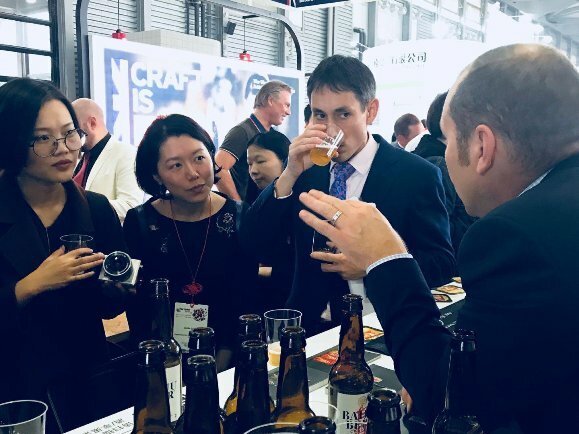 “Getting our beers in front of Chinese buyers was really key, with the opportunity to exhibit at FHC coming through our assigned government trade adviser. The reception we had was phenomenal, and the show has helped us to grow inroads into the country and to build contacts, something that can be a real struggle if you don’t have support. “Securing our first order hasn’t been without its challenges. Selecting international markets was an information intensive process, which required a lot of due diligence, but government trade advisers can help firms jump over export barriers such as these. “Seeking expert guidance is key and there’s a lot of support out there for any firms looking to export produce to markets like China. If we can do it, then I’m sure many other firms like ours can too. Mark Robson, regional director for Yorkshire and the Humber at the Department for International Trade, said: “UK food and drink firms exported £439.5m worth of produce to China in 2016, and by the first half of 2017, China was the eighth largest export market for UK businesses. “This shows how much opportunity there currently is for UK producers in East Asia, and Baijiu Beer Company has tapped into this trend with a brand and product that speaks to Chinese consumers. Baijiu Beer Company sells its beers into Chinese supermarkets and restaurants in the UK. The firm is also looking at moving into the Chinese market in the US. Firms looking for support should contact 0300 365 1000 or email yorkshire@mobile.trade.gov.uk. They can also visit great.gov.uk, which gives UK businesses access to millions of pounds’ worth of potential overseas business, helping them start or increase exporting.